Rockman Zero 3 (ロックマンゼロ3, Rokkuman Zero 3?) 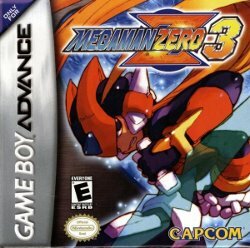 was originally released in Japan in 2004, and later localized as Mega Man Zero 3 in Europe and North America. It is an action platform game developed by Inti Creates and published by Capcom for the GBA. It is the third game in the Mega Man Zero series of Mega Man games. At the start of the third game, the following synopsis relates notable events of the previous two games. The third game starts 2 months after the events of the second. A recently crashed spaceship emits energy similar to the Dark Elf, and Zero sets out to investigate. Not long into the mission Ciel and a pair of resistance members are captured by Neo Arcadia as Zero enters the ship. But they are not harmed, nor are they held prisoner, as an incident breaks out involving a giant reploid named Omega that not even Leviathan and Fefnir combined can handle. Zero interrupts the battle and is left to handle things on his own. Soon thereafter Dr. Weil is introduced, as well as a rebuilt Copy X (with a noticeable stutter in his speech) who has reclaimed leadership of Neo Arcadia, much to the chagrin of Harpuia. After a missile is launched at a densely populated area to enable Omega to capture the Dark Elf, Zero goes off to fight Copy X and defeats him. But before Copy X can transform again, he is betrayed and killed by a trap placed on his body by Weil. With Copy X out of the way, Weil assumes command of Neo Arcadia and uses the Dark Elf and Omega to seize control of all Reploids. After Zero destroys both Baby Elves, he heads to destroy Omega's Dark Elf enhanced form, defeating the Reploid twice. From the remains of Omega, however, rises a Reploid that looks just like Zero and at that moment, Weil informs Zero he is merely a copy and that Omega inhabits Zero's original body. After Zero and Omega do battle, Mega Man X appears and confirms to Zero that they fought against and sealed Omega a century ago. Before Weil can force the Dark Elf to rejoin with "Omega", the Guardians appear and further damage him. Eventually Zero makes the decision to finish him off, regardless of him being inside Zero's real body. In the explosion, Zero is knocked out and sees visions of X. He tells Zero that he is out of power and can no longer exist in the human world. He is confident Zero can protect the world from now on and fades away (presumed to have retired to Cyberspace). The fate of the Guardians, while not shown, is revealed by official materials to have died in the explosion (Rockman Zero Official Complete Works artbook). Zero's unconscious body is brought back to the Resistance Base by the Dark Elf. With Weil's defeat, the curse placed upon the Dark Elf (now known as Mother Elf) is broken and she flies away. But losing Omega and Mother Elf still did not change the fact that Weil was now the undisputed ruler of Neo Arcadia. The humans living there would soon realise the wrath of Dr. Weil. This page was last edited on 18 August 2018, at 00:48. This page has been accessed 24,497 times.